Turn any fan into an air cooling misting fan using this Misting fan ring. This easy to install product by Mist Cooling Inc comes attached to a 160 PSI misting pump for small scale outdoor cooling purposes, like patio misting or misting of your barbequing area of your backyard. Enjoy the outdoors, even on unbearably hot summer days. 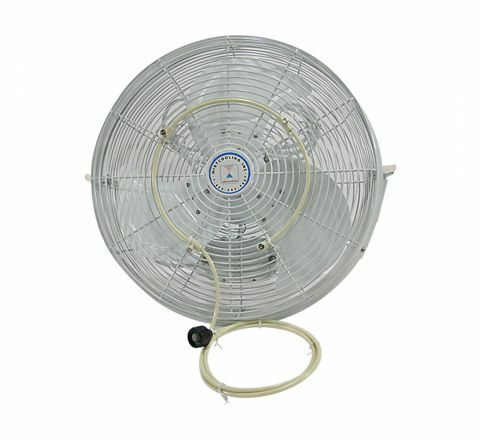 Turn any ordinary fan into a cool misting fan using this Stainless Steel Misting Fan Ring! Attach seamlessly to any existing fan you have and instantly enjoy cool breeze. Use with our Mid or High pressure mist pump for even better cooling results. Rated up to 1500 PSI. Residential or commercial, now you can enjoy the outdoors, even on unbearably hot summer days!